Helping you & your company achieve sustainable growth. If you’re anything like me, the first few yoga classes you went to were confusing and had minimal life-changing impact. I remember leaving my first classes thinking, wow, I can’t take myself or anyone around me serious. Yoga was so much different than anything I had ever experienced. I spent my childhood playing soccer, lacrosse, softball, basketball, and pretty much anything outside. However, the closest I ever got to yoga was team stretching before soccer practices. Now, as I go through 200 RYT yoga teacher training in my late twenties, I see the clear benefits of yoga and how those around me can practice yoga to achieve their own goals. And I wish it was something I learned at an earlier age. Part of my training includes understanding the benefits of yoga. All 77 of them. Having spent the past decade of my life working in technology, I know my body gets stressed from always-on work, social pressures, and expectations. I can easily get tension headaches, migraines, poor diet habits, lack of energy, apathy. While I found it easy to become stressed in an ever-connected world, I found it much more challenging to relax and rest. I used to channel stress energy by running. First a half marathon, then a full marathon, and then injuring myself while training for my second full marathon. Something was still missing. I could tire myself out from thinking, but when I wasn’t tired from running, negative voices and tension returned. It wasn’t until this past year where I took a deeper dive inside myself to change the way in which I think, training the voices inside my head with controlled breath and movement. Yoga has given me a way to reduce stress, become more aware of my body and the tension it holds, and create self-control where action reigns over reaction. My journey to loving yoga didn’t happen overnight. Knowing what I know now, there are a few fundamental things I wish were shared with me the day I first walked into the studio. I want to share these tips with you in hope that your journey to loving yoga, and its countless benefits for your mind, body, and soul, will expedite. 1. Show up with an open mind. Many beginners are unsure of what to think of their first class. Maybe even laughing at others, themselves, or the instructor for what they’re doing or saying. I had my own nervous laughs that stemmed from my own insecurity of not knowing what to do as the rest of the class flowed right along. Yoga is boundless. You can learn something new about yoga’s history or your own practice every day if you let yourself. Show up to your first few classes with one question, “what can I learn from this?” and think through what you learn from each class. By focusing your energy on something positive – like new learning – you move your brain away from thinking about your own insecurities. You’ll get more out of your class and be one step closer to enjoying benefits from yoga. 2. Learn the basics before you move forward. A lot of studios have classes specifically for new beginners. This helps the instructor create a sequence that sticks to the basics and teaches you about the purpose and correct alignment along the way. Yoga is like any sport. You need to learn the basics before you can start practicing to become an expert. Just as you wouldn’t jump to a competitive game of rugby without learning the rules of the game, you shouldn’t jump to a more advanced class of yoga without knowing the basics. Go to a beginner class, admit that you’re a new student, and you’ll set yourself up with the right foundations to grow your practice. Yoga can be done anywhere with a flat surface – your apartment, a local park, a school’s gym, etc. So you have countless ways to practice what you learn. Yoga resources are all over the internet. If there was a pose in class you didn’t understand, search it on YouTube. There are videos of instructors that go through proper alignment and benefits of each pose that you can practice in the comfort of your own home. It’s better to learn from the experts than it is to assume you have the correct posture and train yourself with bad habits. 4. Know that Sanskrit exists. Most instructors learn the different poses names in Sanskrit (an ancient language of India) along with their native language. This can be confusing at first if you’re unaware that every pose can have two names, which mean the same thing. Over time as you go to more classes, you’ll start to pick up different Sanskrit names and be able to repeat some of them. 5. Compare yourself only to yourself. This is probably the most important, yet most difficult thing to do for beginners. While it’s easy to look around and try to be like others, probably more advanced, in your class, it’s super important to turn that focus inward. How is your body feeling? Are you starting to get more flexible? Are you beginning to expand your breaths? Are you able to meditate, allowing thoughts to float on by, for longer? While it’s fine to admire other’s practices, remember that every one is on their own journey, including you. It will take time to progress and it will be important to look back on your own journey to see how far you’ve come. 6. Hold your pose, not your breath. As you listen to every cue the instructor gives for adjusting into the correct pose and before you realize, you may start to hold your breath and tense your face. Your breath is what gives your body the oxygen it needs. When you take deep breaths in different poses, you send oxygen through the blood to the organs that need it. This breath to movement is what makes yoga so powerful and rejuvenating. It’s what makes you feel awake after starting a class drowsy. And it’s half of the equation for getting the benefits out of yoga. Listen to the cues your instructors share, specially the ones pertaining to your breath. Align your poses from the earth up. If your stance is wrong, everything above your feet will be off and you won’t get the most out of the pose. Engage from the core out. There will be many poses where you need to adjust yourself and engage different muscles. Start with core. It will be challenging at first, but over time you will build the strength you need to sustain an entire class. As you INHALE, think as your body as lengthening. Whether it’s lengthening the reach of your arms out wide in Warrior 2 or extending the length of your spine in Extended Mountain before you hinge forward to reach your toes, think of your body as stretching out during the inhale part of your breath. As you EXHALE, think of your body as sinking. Whether it’s sinking your tail towards your toes in Child’s Pose, or your heels into the ground during Downward Dog, think of your body as sinking deeper into a pose during the exhale part of your breath. Now it’s time to start! Grab your mat, water bottle, and towel, and sign up for your first (or first since reading this post) yoga class. Show up and start putting these tips to work. If you find that you’re still not getting anything out of your practice, please send me an email or find a time on my calendar to connect. I’d love to learn more about your experience and how I may be able to help you on your journey. Please tell me you can’t tell a story through music. This playlist symbolizes the ups and downs of growth. I thought to myself… sure, our high-performance loving culture popularizes increasing growth rates and shares all of the tactics to get there, but we tend to ignore the second half of the equation… rest. Let’s add on that there’s little to no escaping the round the clock notifications, emails, tweets, claps, likes, and slacks. If we’re not careful, it’s easy to crave our fill of dopamine, stay connected, and become addicted to our devices. We’re living in an always connected world that has been largely untested for negative long-term effects. For the past two years, I had a front-row view of how companies are growing metrics like “time spent” and “daily active users” which could conversely be thought of us how addicted users are to said platforms. These metrics are grown at all costs, with little preemptive philosophical discovery around long-term effects of addicting users to devices. After a few months of feeling exhausted, uninspired, addicted to social media, email and Slack, I started to reevaluate things. I knew there was more to life and if I wanted to help make the world better, I’d have to start with myself. After reading Lost & Founder by Rand Fishkin, I took a step back from my day to day and crafted my own personal core values. I started putting these core values into action and used them as a filter for any new and existing engagements. Does this align with my core values? Then I went on vacation and disconnected from everything but the people and environment around me. I rested, read books, laughed with friends, got lost outside, and spent time with family. I felt alive and re-inspired. This renewed feeling fueled my personal exploration on what happens when there is no rest in the growth equation… burnout. I started asking friends, colleagues, and family about their personal experiences with burnout, and there was a clear pattern. Burnout effects most people in some capacity and depending on a person’s personality and environment, it can manifest in different ways. My gears were spinning. I reached out to a previous, well-respected colleague, Dr. Galen Buckwalter, to share my thoughts and interest in understanding the phenomenon of burnout in this always-on world. Galen shared that he was coincidentally working to create an assessment with Kaiser Permanente to understand physician burnout and how psychometrics can be used to intervene with personalized recommendations to combat and recover from symptoms of burnout. It was a no brainer for us to collaborate on this project and I started as a Clinical Researcher for psyML where I’m currently immersing myself in personality profiling and how psychometrics can be applied at scale. Meanwhile, I also decided to enroll in a yoga teacher training with the idea that I’ll immerse myself in what I hypothesize to be a part of the rest solution – breathing, being mindful, building community, understanding, strengthening and stretching one’s body, mind, and soul. Not to mention it’s something I’ve wanted to do for years and could now afford to do. While these new areas of learning are quite different than what I’ve been learning to date (helping companies adopt growth process at GrowthHackers), I see them being the missing pieces that will contribute to a new perspective of how we approach sustainable growth. To help connect new ideas to my existing knowledge, I want to share what I learn and how this knowledge can be applied more broadly with my lovely network (you). So, I’m in the process of launching Growth Gal, a work-in-progress blog focused on helping people and companies adopt sustainable and ethical growth practices that help make a positive impact on humanity and the environment. Have questions, thoughts, our words of wisdom to share? I’d love to hear from you. Please leave them in the comments below. Running a marathon isn’t easy & neither is growth. On a run yesterday, I started reflecting on the San Francisco Marathon I completed in 2015. After a day at GrowthHackers helping teams focus on sustainable growth, I started drawing parallels. Training for a marathon isn’t easy. I remember the days I would wake up at 5am to get to the track before work and run 10 miles of intervals (jog, sprint, repeat). Oh thank goodness that workout is done. I would say as I headed into another work day. But oh wait, tomorrow’s workout is going to be even harder. And next week? Even harder. Everyone that signs up for a marathon wants to finish it and put a new shiny 26.2 sticker on their car. Just like everyone working on a startup wants to be to the next unicorn. I see it day in and day out. Smart people wanting to grow their users and hockey stick growth, with the finish line filled with unicorns and puppies in mind. Unfortunately, this perception of reality is far from the truth of what it takes to sustainably grow a company. In reality, not everyone understands the diligence and hard work that goes into both running a marathon and unlocking sustainable growth for a company. I know I didn’t when I signed up for a marathon on a whim. There are some days I don’t want to run. There are also some days I feel like banging my head against the wall when it seems like nothing is working. It’s in those moments that define you and your success. Do you keep pushing on through the discomfort and frustration? Or do you give up? For anyone focusing on growing a company, I think there’s a lot to learn from the approach it takes to get to the finish line of a marathon. Let’s dive in. In order to make time for training and ensure your body is getting the nutrients it needs to sustain distance running, new habits must form. Getting up in the morning (even when you’re NOT a morning person), to get your run in for the day, will slowly and painfully become routine. You’ll find beauty in the sunrise and the way you feel for the rest of the day. Drinking copious amounts of water to ensure you’re not dehydrated will become second nature. And likely, a canned response of “I’d love to, but I have to run first” will begin rolling off the tongue. And when it comes to growing a business and the value customers receive from your product, continuously testing new ideas needs to become routine. Constantly aligning your team on the biggest growth opportunities (or objectives) will become a regular point of conversation. And likely, a canned response of “Great idea… we should test it!” will begin rolling off the tongue. Using data to test growth assumptions needs to be habitual. The entire team needs to understand and develop this habit. At first it will be hard, just like running can be. But after a few weeks of testing and adding new learnings to your company’s knowledge base, you’ll start to reap the benefits and get hooked on the “endorphins” of finding new wins. When one idea works, great, take it one step further by operationalizing wins and generating new ideas to test from what you learned. When an idea doesn’t work, learn what you can from what didn’t work and use it as fuel for creating new ideas that can be tested. Training for a marathon requires plenty of planning and continuous tradeoffs. To properly train, you‘ll likely encounter a training program like the one I used below. 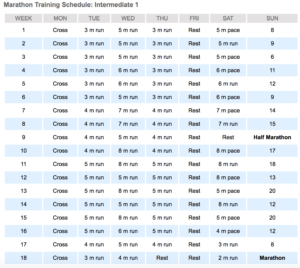 To put it simply, you can’t train for a marathon on a whim. It requires scheduling when you’ll run to ensure the weather isn’t too hot to totally dehydrate you and where you’ll run to ensure you don’t end up lost or in a bad neighborhood. All while ensuring your day job and friendships aren’t compromised in the process. As a leader of growth, you must plan for resources to be available and evaluate the tradeoffs to ensure you’re prioritizing growth over routine activities. Just as a runner plans for their runs to get longer, you should also project your team’s throughput to increase as time elapses. In training for a marathon, if you try to increase the mileage per week without increasing the amount of food you’re adding to your diet, you will not perform to the best of your ability and your training will be unsustainable. I’ve learned this the hard way and don’t recommend it. And in growth, if you try to grow anything (acquisition, activation, retention, etc.) without adding new ideas to the testing process, your growth will also be unsustainable. One winning test in your team’s knowledge base is not enough to rest on your laurels. Instead, you should be looking for new ideas from the winning (and losing) tests to try implementing next to help ensure growth doesn’t stall. New ideas are the leading indicators of growth for any organization. If there are a lot of ideas contributing to your growth objectives, you’ll have plenty to test and your learnings will increase. However, if there are no new ideas from your team, your inputs for growth will be non existent and the learning that contributes to growth will be obsolete. “Most people think of companies like Facebook, Uber and Airbnb as once-in-a-generation ideas that are a bit like catching lightning in a bottle. That somehow they were destined to be great. That’s actually not true, it turns out. All of these companies faced existential moments of crisis that could’ve killed (or could still kill) any of them. What they all do, which goes under appreciated I think, is that they learn faster than anyone else what it takes to grow, and they use that speed of learning as a massive competitive advantage. Getting into distance running, you start to realize that each person is likely challenging themselves more than they ever have in their life. Whether it’s training for a new PR or simply to finish a marathon, it becomes clear that the race is against yourself. It’s easy to look around and compare yourself to others. And even easier to get down if and when your training partner starts to train faster and outpace you. If you don’t focus on training to make yourself and your race better, it will be very easy to get distracted and give up. In growth, this is also true. You can look at other companies that are taking off and try to be just like them. You can try all of their tactics and when the tactics fail for your company, you’ll be left in the dust wondering what went wrong. That’s why it’s important to understand your company’s growth is like no one else’s growth. The hard work that your team puts in will determine its success. You need to be aware of your surroundings, but you can’t focus on them. Instead of obsessing on the competition and how fast they are running, turn that obsession inward to your own company. Ask how to make your own processes more efficient, how to provide value to your customers that no one else can, and don’t be afraid to test new ideas. Now what’s stopping you from training for your first marathon?